The house, designed by SeARCH and Christian Muller Architects, includes "all the facilities a common house has, such as a guest room, an entertainment area, but also 'specialized' interiors like an underground pathway. The entrance is a wide oval opening that you are driven to by some traditional stairs made in stone. Large windows make it noticeable and draw attention to the inside décors- that is when the people living there are up for some company." 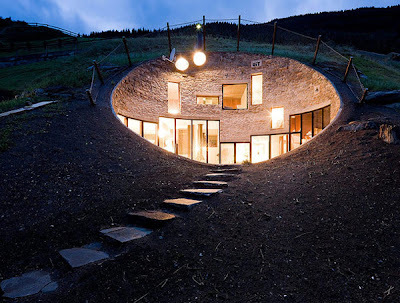 Dig down here for more photos of this amazing house!